I love banchan (반찬) – most are easy to prepare and can be kept in the fridge for a couple of days. There’s warmth and love-from-home feeling when you come back from work and open a fridge full of ready to eat banchan. Lotus roots have a lot of good benefits – you can read it here. It’s easy to purchase from wet markets or the supermarkets. Lotus roots usually comes in 3-5 “joints” or tubers. For a small family like mine, I prefer to buy lotus roots in the wet market because I can chose and purchase the right size of root tube, instead of buying a pre-package of lotus roots in the supermarket which are usually too much for us to finish. Making Yeongeun Jorim is simple because there’s only 1 ingredient to cut. However, the time spend at the stove is about 30-45 minutes. 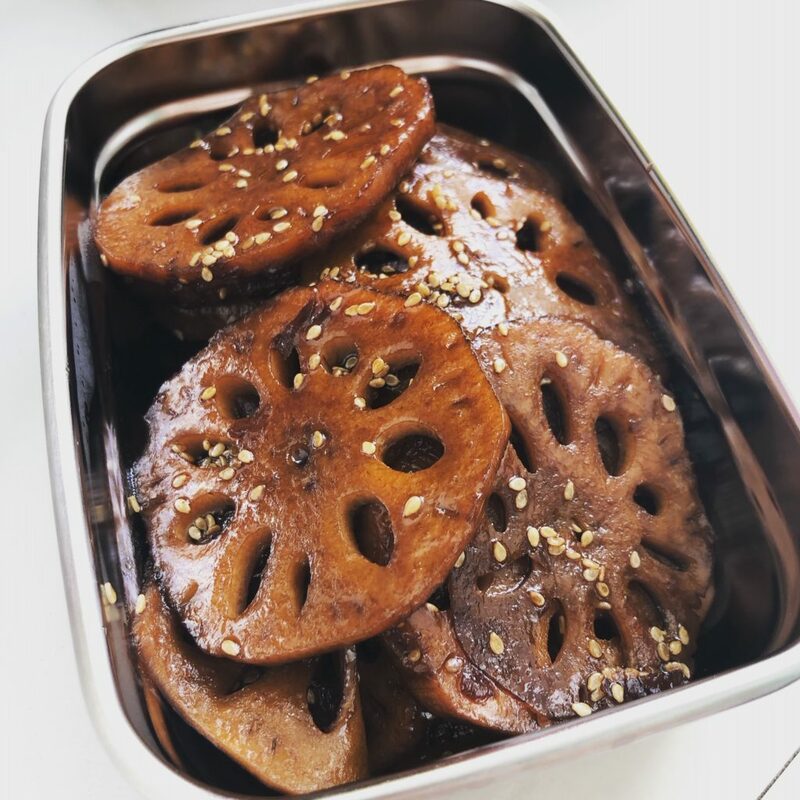 Especially at the last 10 minutes, I have to really stare at the lotus roots to make sure that they are not over caramelised. But it’s all worth it because of the good benefits of lotus roots, and a lovely banchan for the next few days. The greatest reason of all – the hubby loves it! I followed the recipe from Korean Bapsang. It has a nice flavor, which gets better over the days. By the way, I am a great fan to Korean Bapsang‘s recipes as the flavoring and taste are closer to my family taste. This entry was posted in BZ Kitchen, Korean Dishes, Salad / Side Dishes / Ban Chan and tagged Food, Recipes.